By reviewing Quaron's Children of Men I couldn't help but acknowledge the long line of near future apocalyptic dystopian fiction with which we have been presented in modern times. Some of the works included in this genre are more politically oriented than others and that is true for Children of Men as for Orwell's 1984. 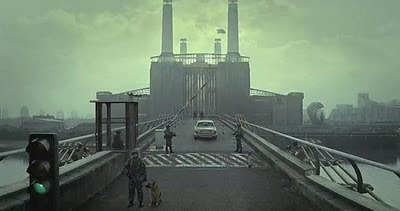 I am including in this argument Pink Floyd's The Wall even if the later is more allegorical than dystopian. It is easy to see the similarities between 1984's "two minutes of hate" scene - in Michael Radford's cinematographic version - and The Wall's "Run Like Hell" / "In The Flesh" scenes. Despite all the personal and introverted implications, The Wall is actually a strong satire of utopian society. As in most dystopian fictions the general idea is that by trying to create a "better" and "perfected" society - one that is agreeable to everyone - all that really happens is the stripping away of people's free thought, free will and basic humanistic expression. Take "Another Brick in the Wall" for example. The "education" described in the song seems like "thought control", a type of control where certain concepts are methodologically imprinted in the students' mind. The Establishment tries to accomplish complete conformity, a great wall where everyone is but a part of the whole. Even with the above parallels the most Orwellian of Pink Floyd's albums is Animals, being based on Orwell's own Animal Farm. If The Wall is a semi-biographical take on Syd Barrett's life, Animals is the anti-authoritarian album par excellence. You don't have to be Pink Floyd's greatest fan to know that they were into pigs. A pig is featured in the Animal's cover design and several inflatable pig props were used in their shows dating back to the mid-1970s. 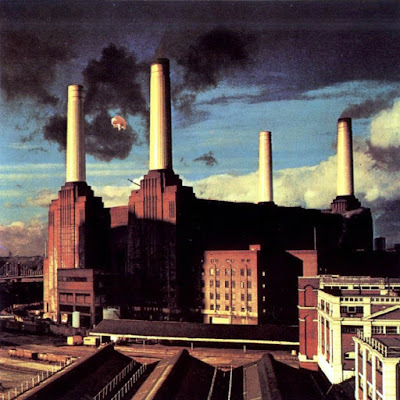 In fact, "the first Pink Floyd pig was reportedly named “Algie” and designed by Roger Waters himself for the cover of the 1977 album Animals." This cover has unquestionably gained iconographic status today. 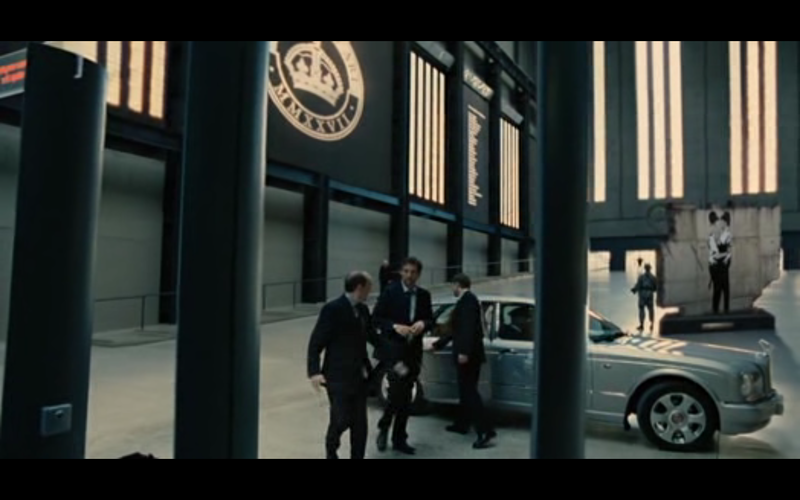 Here lies one of the many pop culture references present in Children of Men and a critical element in one of its most complex scenes - the "Ark of the Arts" scene. According to Slavoj Žižek, "the true focus of the film is there in the background" being "crucial to leave it as a background". That's is the case of many other films of which I would highlight The Truman Show or even Blade Runner. Žižek tells us this is the opposite of what he calls "anamorphosis". In other words, if you look at the oppressive social dimension too directly it becomes invisible. It is possible to see it in an oblique way only if it remains in the background. 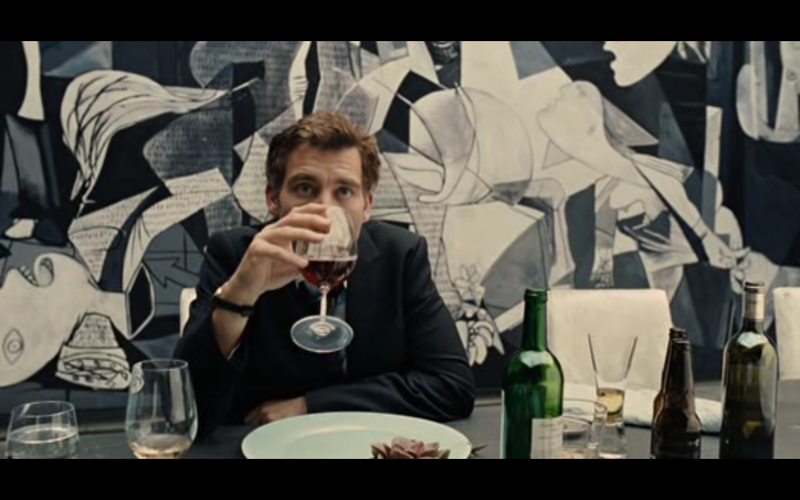 In Children of Men, the "infertility subject is not just a pretext for the hero's inner journey from this apathetic anti-hero mode to a more active engagement". It is the other way around: the hero's fate remains the lens through which one can see the background with an increased sharpness. In the scene mentioned above, the Battersea Power Station is combined with Tate Modern (former Bankside Power station) creating the "Ark of the Arts" - you can even see the Millenium Bridge, a pedestrian footbridge in front of Tate Modern that, in this case, leads to the Battersea. 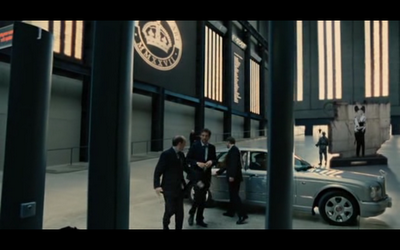 This ark is a governmental entity, a safe depository protecting important works of art from destruction. Interestingly as the car goes down the driveway into a mimesis of Tate Modern's turbine hall you can spot a wall fragment with a piece of stencil art by the UK’s most inflammatory genius, the street artist Banksy. The wall in which the stencil "once stood" has been taken out of its place in an analogy reminiscent of the graffited berlin wall. This is actually the first work of art featured in the Ark, even before any of the "classics" are shown. 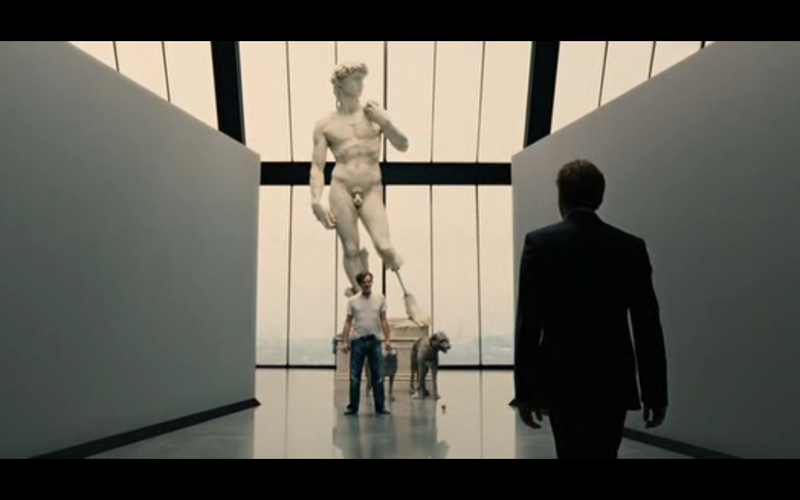 A mutilated David by Michaelangelo is next followed by Picasso's Guernica. Both pieces are also taken out of context - Guernica has been reduced to the dining room wallpaper. Besides the fact that Banksy's "Kissing Coppers" would then be considered something like "modern art" with all its implications one thing become clear: every one of these pieces is deprived of it's place - they thus have become somewhat meaningless. 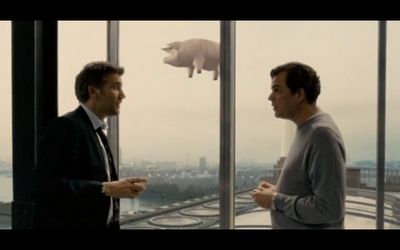 At last, when Clive Owen's character and his cousin are discussing near a window with the view of London from Battersea one can see the Animals cover recreated as a de facto work of art. This pink pig flying between Battersea's chimneys is the first piece seen by Theo while crossing the bridge and it marks a chronological succession that begins with something created sometime in the near future, followed by today's street art (taken out of context as it will), a modern and a late modern piece. This succession comes full circle with a not yet seen perceptive of Algie the Animals pig. Now that Lazarides owns the street Artists and is putting them on galleries one begins to question how wrong Quaron's prediction could be.